Also, thanks to my readers for the feedback and awesome reviews. I do hope the second part is as successful as the first. “Amazing…” was all Professor Hackle could murmur as he found himself face to face with what was once his own creation. The Cybertron just appeared to be staring back, then turned to look at Chance once the tabby spoke up. “Um… professor… Is there any way he can… explain everything to us?” he queried. The small robot watched them. Exactly what did they mean by ‘everything’? He hoped Jake Clawson didn’t mind if he *did* tell them. The Cybertron complied, Chance watching him as he did so. Once the process had begun, Hackle took a seat. Being a computer, the Cybertron finally told them everything. He scrolled down a complete log of his conversations with Jake Clawson on screen. And, it was only in words. Nothing to indicate Jake’s tone or mood. “Holy… Kats…” Chance whispered, stepping up to the computer to read through the log. The Cybertron stood by him, watching him curiously. Then, for some reason, he found himself fixed on Chance, those shiny eye-like optics never leaving the tabby. Feeling himself watched, Chance turned to look at the robot, arched a brow, then let a small smile curl around his face when it turned away. Inquistive, he squat down to its level, leaving Professor Hackle to read the rest of the scroll. “You want to tell me something, don’t you?” Chance queried, looking into the Cybertron’s “eyes” as he did. The Cybertron watched him, as though processing something fairly important before it replied. “It’s me… Buddy….” came the next display of words. The grin on Chance’s face abruptly disappeared, his green eyes flying wide. Oh, he recognized those words. He recognized it any day… even after five years. His heart was beating restlessly against his ribcage, tears forming at the corners of his eyes. A new revelation. Jake *was* there. Maybe not in flesh and blood, but it *was* Jake. And, he was doing the impossible to contact him. Curious, Professor Hackle turned his attention on Chance. If Jake was able to see through the Cybertron, then he could see the obvious wetness surrounding the corners of his best friend’s eyes. “Jake…” Chance began, then cut it off. Now was not the time for sentimentalism. “Why… How… No. I gotta get you outta there! Let me find you. Where are you? !” Now was a perfect time as any to strike. But, Jake had other plans. What was this?! A warning?! *Jake* was *warning* him?! How dare he?! Why, Jake? Why couldn’t he just get to the point, the tabby mentally cried. He wanted directions, he wanted a way inside to rescue his best friend. Not a lecture. The game of twenty questions was starting to irritate Chance. “I’m getting you outta there…” Chance growled. The robot let itself be shook, sending a message. Shakily, Chance let it go. Teeth gritted, he stood up. Fists shaking, he paced around the room, ears flat against his skull. Suddenly, letting out a cry of rage, he knocked off various old gadgets from a working table nearby, slumped into the wall and slid down to the floor. Professor Hackle watched him sadly, letting Chance curl himself up in his own misery, crying uncontrollably. He let him be for a while, looking at the Cybertron, wondering what was it that was going on in the mind of Jake Clawson. Why wasn’t he letting his best friend come to his aid? “Chance…?” he asked after a while, going over to the tabby. Chance remained crying, silently, but let his ears perk to hear Hackle. Looking up, he saw the professor bending by him. Hackle watched him worriedly, then watched as the Cybertron curiously followed Chance as he headed upstairs. However, it didn’t get far once Chance turned to it. The robot paused, giving out a mournful type of beep. But, it appeared to be more cheerful once Chance managed a smile. It was the usual swill tonight. Nothing to write home about… that is, *if* there was a home. He was once an Enforcer lieutenant, proud of his occupation, proud of being in the skies with his squadron. There was that longing to be amongst the clouds once again. But those days were long gone. He was grounded now… and had been for more than four years. He was grounded in a labor camp… one of the few the Metallikats had built in order to have their robotic counterparts built. He was told this had once been the Enforcer Salvage Yard. Acres of old cars and jet parts stretched for miles. Pools of oil and rusted tools dotted the ground, and lines and lines of recently washed laundry were laid out to dry. Hadn’t this once been the infamous hideout of the SWAT Kats? Of course, the once underground hangar *was* where the workers slept. He distantly felt another kat sit beside him, giving out a tired sigh as he did. The former enforcer had to smile at least a bit. Work camp was always exhausting, and even a small break helped every now and then. Then, he looked up to see the ‘other kat’, finding that it was none other than the kat he respected most. Commander Ulysses Feral didn’t look much beyond disgruntled. His once prideful and lively figure had been stripped off with premature aging. Bits of gray hair were showing on his massive chin, which had once been clean shaven to represent him as a figure of authority. The younger kat watched him, curious, wondering how his commander was holding. Even here, Feral was still the commander and their superior, and they treated him as such. Feral merely looked up towards the skies. “No moon tonight…” he stated matter-of-factly. The younger kat’s ears pricked forward. The younger kat nodded, set aside his bowl and walked towards his position as Commander Feral made his way towards another area of the camp. Feral pondered his options. This was the only opportunity they had and they could *not* ruin this operation. Walking into the empty building in the center of the yard, he looked at the only other kat in the empty hallway, monitored only by cameras. He cleared his throat loud enough in order to catch her attention. The once Lieutenant Felina Feral looked up from her mopping, watching her uncle make a slight motion skywards. She understood and gave him an assertive nod. Feral returned the nod and walked back out. Walking to another area of the yard, he gave out a slight whistle. The Megakat Anthem. It had to do. The others caught the signal, scrambling in no time to pre-arranged positions. Feral reached under the hood of a car and took out a basic Enforcer blaster, watching as his men did their own duty. One slid a blaster from the dirty clothes he was washing. Another slipped out a blaster from the back seat of a beaten up vehicle. This was it. Their moment had arrived. It was time to get out of this pit from the bottom realm and seek their freedom. The camp guard, a kat himself, one that had been promised his life as well as monetary value in exchange for loyalty, never saw the blast coming towards him. In fact, it came so sudden that he’d passed out without a sign of shock. The Enforcer that’d blasted him had started the fight. The first gun shot. The battle had begun. “MOVE!” was the only word Feral screamed out that night, running into the work camp and blasting into the opposition. Some kats joined to fire at the guards in cover fire, others bolting for the perimeter fence, taking innocents with them. At that point, Feral turned to look for Felina. Surely his niece was among those yearning for freedom. The ebony haired she-kat was there, alright, heading towards the fence, herding along a couple of kittens that stuggled to keep up with the others. There was no time. Quickly, he ran to scoop up one of the kittens, holding him close. Felina nodded to her Uncle, taking the other kitten in her arms and made a run for it. Feral followed, firing behind him towards the incoming guards as Felina dove through the hole the others had made. He checked to see if anybody else remained as the last group ran out. Only guards rushed forward. Any kats that didn’t want to be involved had long since hidden. He gave it no further thought. Firing a few more shots, he ran out the fence and hurried on, out of the spotlights’ range and into the nighttime swamps beyond. Chance looked behind him, eyes huge, staring back at the kat that’d been chasing him to the dead end he found himself in. His pursuer was standing at the end of the impossibly long, dark metal hallway, eyes glowing red. The smaller kat’s eyes were narrowed. Some kind of bladed weapon was noticeable on one arm, a gun mounted on the other. Not one trace of fur or flesh remained save for Jake’s face. He’d become a full machine. “What’re you talking about? !” Chance demanded, arms spread out. Destiny?! What did destiny have to do with this?! Neither he or Chance believed in fate! The words appeared to have hit Jake like a stray bullet. Instantly, he visibly quivered. Faintly, but it was a shudder nonetheless. “This is… This is my duty!” he stammered. “Your duty is to protect the innocent!” Chance shot back. “NO!” The smaller kat screamed, covering his ears. Unaccountably, he had hands again. No weapons in sight. Chance paused, eyes wide, yet quizzical. Could it be…? “Your duty is to free the city from evil!” he insisted towards Jake, taking a step towards the orange kat. Jake collapsed to his knees at Chance’s persistance. His hands never broke free from his ears, as though creating a wall. As though protecting Jake from the harsh words that Chance Furlong used in order to prevent him from reaching his goal of conquest. “NO!!! !” He curled up into a ball, shaking. “No…” His words turned into sobs. Was this true? Was what he’d strived so hard to obtain so wrong? He tried to put two and two together. Why was it so wrong to dominate? Distantly, he felt a hand on his shoulder. And, it made him quiver even more. The smaller kat let himself be helped up, legs wobbly. “Chance…” He looked at his friend, their eyes meeting, his own no longer red. They were their usual soft and amber color. “Alright.” Tiredly, Jake leaned into his best friend, holding on for support. Chance smiled. At least Jake seemed to be regaining recognition of who he was before. All they had to do was get out of this metal fortress and back at Hackle’s. It wouldn’t take long, Chance figured. He abruptly paused, looking up, eyes large as Enforcer SWAT team snipers dropped in from every direction. Enforcers?! How?! How did they infiltrate Metallikat Headquarters?! When did they do it?! “There he is!” one of the snipers yelled to his comrades, laser rifle raised to take aim at Jake. Chance felt his blood run cold, his fears taking a toll over reality. No… NO! He was unable to finish his sentence as the targeting laser came to bear on Jake’s chest. Ignoring Chance’s pleas, the sniper merely followed what he’d been ordered to do. Chance’s screamed echoed across the room, the frightening images of the laser forever burned in his mind. He woke up, panting, crying, eyes looking out and around until he realized where he was. He didn’t figure it out, however, until the Cybertron came up to his bed side, beeping softly. It’d followed him despite Chance’s earlier orders. The Cybertron beeped again, softly, trying to give out the facsimile of a worried tone. Another worried trill came from the Cybertron, eyeing Chance curiously. Surely he wasn’t planning on going out there again? Chance Furlong was serious. Moving around so he’d be in Chance’s view, the Cybertron made a mock sort of salute while uttering a determined beep. He was going, too. Complying, a map appeared on the display. Now, if the Cybertron had ever witnessed what the non-metallic life-forms called a “conniption,” then that was probably what he would have called Chance Furlong’s reaction to the grid. Never had it seen anybody overreact to something like that… not even Jake Clawson when he was in one of his bitterest moods. “THAT PLACE IS HUGE!” Chance squacked. “And, it is well fortified…” added the robot. Chance had to chuckle at that. Recharge cycle indeed. It’d be 5:00 a.m. and he’d still be out that door in the blink of an eye. “I can’t waste anymore time. Five years is enough.” Yes, five years had been enough. Now that Chance knew a way in, nothing could stand in his way. Not even sleep. “I’ve gotten enough rest.” Chance stood up. The old feeling of adrenaline was pumping through his veins once again. “C’mon…” He made his way out the door after putting on his Glovatrix. The Cybertron gave out a noisy sigh and followed. It had once been a city of prosperity, its citizens living life as they always did. Nothing was unusual in MegaKat City. Business increased annually. But, so did the attacks. And, it was nothing new to Commander Feral. He’d watched the city grow. And, he’d watched the increment of crime as well. Psychos that were out to conquer the city and bring it to its knees with no remorse. He’d done what he could to protect his city. He really had. But, even his Enforcers were unable to stop the robots. Even those annoying SWAT Kats had been welcomed to help at any time. But, he’d heard that one of them had joined forces with the wrong side. Why? He didn’t know. And, the other SWAT Kat had barely kept his ground until the Turbokat had been destroyed. What *had* happened to Furlong? He’d managed to catch him without his mask when the robots attacked, but never saw him again once he and his Enforcers had been imprisoned. Probably sent to another work camp. He sighed. Five years had worn the commander out. Now, standing among the swamps to watch the city lights, he wanted to gain his pride *and* his city back. “Some burns, nothing severe.” Felina smiled a bit at that. At least they made it out without a single loss. Felina nodded, making her way to stand beside her commander and father figure, looking out towards the city lights with him. “Do you think we have a chance, Uncle?” she asked stiffly, her face set, determined. 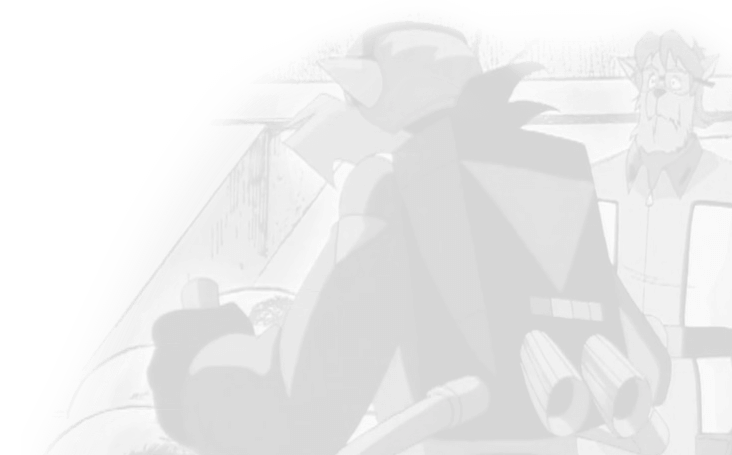 Feral only sighed heavily once again, his eyes never leaving MegaKat City. The Cybertron rolled behind the Chance across the lab, the tabby’s metal feet clattering about the linoleum floor. It eyed his “disguise,” thinking that they *should* have woken Hackle or they’d both be toast. “I believe we need assistance…,” it admitted. Chance sighed, giving the robot a mock sneer and a raspberry, only to be returned with a recorded sound of the same thing. “What is all this noise?” Professor Hackle came shuffling in, half asleep, his tail dragging noiselessly across the floor. Pausing, he looked at Chance. The tabby looked up from his intellectual conversation with the Cybertron and towards the professor. “Um…” He then looked at his “attire,” and watched it as it slowly fell apart, bit by bit, wincing as every piece of metal fell to the floor in a clatter. At that, all Hackle could do was arch a brow. If it had ever been given the ability to laugh, the Cybertron would have. Unfortunately, all it could do was just comment on Chance’s new disguise, even it did look absurd on a non-metallic life form. “I can’t breath…” Chance complained, trying to find an air hole somewhere. “It’s stuffy.” His voice was muffled, almost metallic in a way. “I see we need a bit more of work…” Hackle went to work on the knee joints, the Cybertron leaning over Chance to help him sit up. The robot gave him a sympathetic sound, waiting for more instructions. “Cybertron, perhaps you should fetch something for Chance…,” said Hackle. The Cybertron gave Chance the facsimilie of a glare, a beeping sound saying that it wasn’t amused. “No offense!” Chance said quickly, breathing a sigh of relief as a pleased beep indicated that he’d been forgiven. “The knee joints should function better now.” Hackle and the Cybertron helped Chance up, the smaller robot giving Chance better support from behind to prevent him from falling again. After much practice, Chance discovered he could walk normally, Hackle watching nearby and mentally debating modifications. Upon this task, all Chance could do was wonder. If he was able to walk in this metallic contraption, how good would he be running and attacking? He didn’t bother to think it twice. Moving his arms about with more ease, he attempted a backflip, a roll and a somersault. Beside him, the Cybertron trilled happily. Chance was ready. Hackle returned a small smile, glad that he could help. 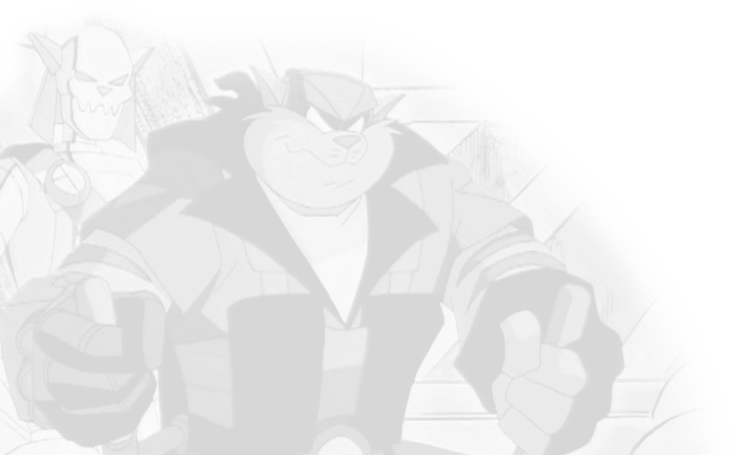 Deep down, he still felt that he’d been the cause for half of it – MegaKat City’s fall, Jake Clawson’s “treason” to his fellow kats…. everything since his creation of the Metallikats. And, if he’d only had but one dying wish, it was to be forgiven for all his past mistakes. “Good luck, my boy,” Hackle returned. With that, the small robot… and the facsimile of a robot, were out the door. No negative statements came from the table. It was funny how he never complained about the padded table… or how uncomfortable it was if he really cared. But, there was no bed for him. He was now a machine… or half of one anyway. Jake grumbled internally, slitting an eye open at the voice. Never in his life did he *hate* the sound of that sentence, much less that last word in it. The word “partner” brought back bad memories… memories of what his life used to be… the life he wanted to have once again. But, these were abruptly erased as the microchip took over once again. “Don’ wanna oversleep, do yas?” asked Molly Mange, standing beside her husband as they watched Jake. “Whyever would I want sleep?” Jake sardonically asked as he sat up. “There’s rumors of a work camp raid that occurred last night…” Mac added. “They were dispatched overnight while you were dozing,” Mac stated, an accusing tone almost noticeable in his metallic voice. Jake only gave them a mean look, nodding at their words. “Sounds like my agenda is catching the Enforcers you lost…” he returned in the same tone. He moved to his computer access terminal. “Right…” Jake got his systems up and running, looking at the readouts as they left. Personally, he thought they didn’t do anything around their headquarters other than gloat about their conquest of MegaKat City. Bah. Sometimes just the sight of those two bucketbutts disgusted him… particularly their constant bickering and idiocy. How he put up with it, he didn’t know. But, all that would soon change. Very soon. The once Enforcers and various volunteers looked at Feral as he stood up, watching him expectantly as he readied his blaster. Their time had come. Some willing, others almost hesitantly, stood up with him. No signs of backing out came. No one dared to challenge him. To tell him that their small band of Enforcers and volunteers couldn’t take out an entire city of renegade robots. Now was the time to reclaim their beloved city, and their lives once again. The kats saluted, some better than others. Feral could only give them an unusual smile, but he sobered in a heartbeat.